Tamara comes from a very musical family. Her college years were spent learning music and choral conducting. 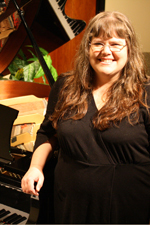 Tamara learned choral conducting at the University of Southern California in Irvine. She studied at Clark College where she earned honors and was in Phi Theta Capa. She is listed in the “Who’s Who of American High School Students” for music and academic excellence. Excellence in grades, leadership, tutoring other students both academically and musically, music performance, student conductor among other things. She has been a conductor of various church choirs. Tamara has studied as a soloist (and has soloed in addition to performing in various groups) in voice, piano, guitar, violin, viola, cello, tenor sax as well as other string and woodwind instruments. Tamara is a member of the National Federation of Music Clubs. She was listed in the 2006-2007 edition of “Who’s Who Among Professionals and Executives” for excellence in music performance, choral conducting and teaching. Tamara has been teaching privately for over sixteen years now and loves the time with her students. If you have a question for Tamara, or wish to contact her, please fill out the form below. The message will be passed along to the Education Center and they will get back to you..